If you're tired of getting suggested tracks by an artist you don't fancy anymore, don't despair! If you change your mind, and wants to give that poor soul another chance, you can always return to the artist's profile and do the same to get them back on your side. Easy-peasy. Wait.. i'm on that Android version and I can't see the three dots at the top? I have a cast button, heart and share and that's it? Hey @Rob Igo, perhaps the update was slow to reach you out, do you mind trying to delete completely the app and go back to the play store to download the new version again, to see if you get the option? @Rob Igo huuummmmm.... that's strange I will go and check again with the rest of the team! Please!! I was getting ready to do some blocking this weekend! ha ha! Hey @Rob Igo I went to check with the rest of the team, we had a big roll out that was supposed to reach the 100% android users today and add that feature... not sure why you don't see it, I'll keep digging to see what could be the cause, but perhaps it just needs a few more days? I'll keep my eyes posted fingers crossed thanks for checking Great feature! Same here - no dots anywhere on artist profiles. I'm on the right app version. I do find the feature when I use the web version, though. 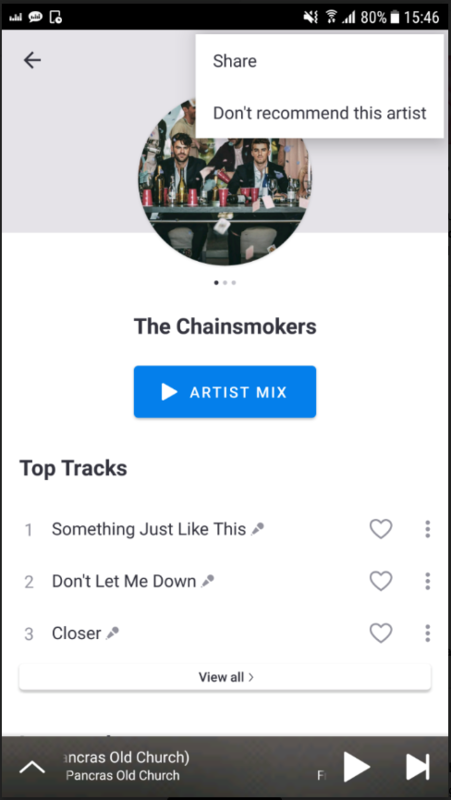 Is there a minimum Android OS version where this new Deezer app can be installed? For example I have Android v4.1.2 on my old Samsung Galaxy II as the latest possible update, and my current Deezer app is v5.4.26.35 with date saying "Copyright 2006-2019". Another question: I cannot enable an audio loudness normalisation in the Android app either like I can in the desktop app, is this option usually available in newer Android app versions? It would make sense on a mobile device where you often listen with headphones, and some songs can suddenly be just too loud. An idea to even improve this, it would be nice to filter the artist from playlists as well. Hey, I spoke to the product team, and it's not available for everyone yet as they have to release new features slowly. But this feature is available on the web for all users right now! Will update my Deezer facebook support group . By the way, I also have the option in the web player now, still not on Android. By the way, I also have the option in the web player now, still not on Android in Brasil. It seems that the new desktop app version 4.2.5 can also block an artist now from being recommended. If this is true im subscribing tomorrow! Also ... how is deezer on chill - jazz - and new atmosferic ? Btw - is there a way to import all my songs from spotify onto deezer - other than manually searching for each of them ? If you click on the ... dropdown menu on an artist profile in the new desktop app, there is an option now to not recommend the artist anymore. Deezer has a family account, yes, but if you want HiFi quality, it is only for one member. Genres are called Mixes in Deezer, and there are ones for Jazz, probably for the others, too. There are tools available to move playlists from Spotify to Deezer like Soundiiz and others. Well ... big hype for nothing! Desktop app .. somewhat usefull .. however i mainly use deezer on my mobile. Android to be more exact. The feature - block artist/song does not function. It should be on everything i listen too. If i dont like it ... i dont. Well, there it goes my 10 euros for nothing! Plus 4 euros for moving the collection with soundiiz. Why the heck is not possible to block certain songs ... is it a big deal ? What Android app version have you got? It should be available on Android as well - it has been released gradually. 6.0.7.128 is the app version. Android 9 . Note 9. And there is artist page ... no three dots ... no possibility to block or do anything of that sort.